The compact Fireface UC has been uncompromisingly optimized for highest performance under Windows and Mac OS. Based on a newly developed RME Hammerfall core the Fireface UC provides revolutionary ultra-low latencies even with multiple channels. It uses two different firmware versions with different transfer methods to remove current restrictions of typical USB audio interfaces. 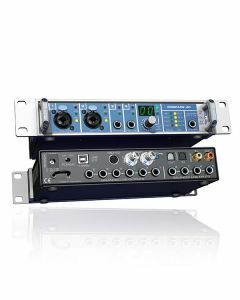 RME’s neatly sized Fireface UC has been rigorously tailored for premium performance under Windows and Mac OS. Finding its foundation in an innovatively engineered RME Hammerfall core the Fireface UC delivers production-changing ultra-low latencies, even with multiple channels. It utilises a pair of different firmware versions with differing transfer methods to eliminate the expected restrictions of typical USB audio interfaces. The unit's operating mode Win or Mac can be alternated directly at the unit at any point in the recording process. Under Mac OS the Fireface's MIDI ports are class compliant, the operating system therefore instinctively uses the included MIDI driver. Under both Operating Systems the available latencies are absolutely exquisite. The lowest buffer offered under Windows has 48 samples, under Mac OS X 14 samples. With this RME provides a level of operation not previously available on USB. Word Clock & MIDI: A Word Clock input and output plus two MIDI I/Os (special breakout cable included) complete the list of features and turn the Fireface UC into an entire audio system of the highest quality.